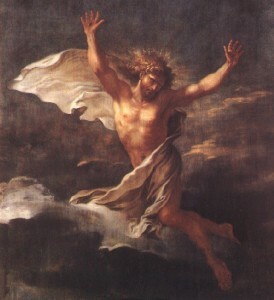 The Resurrected Christ by Salvator Rosa (1615 to 1673). My greatest desire is to be with Jesus!!! A very impressive Christ, as is to be expected from one of the most imaginative artists of the Baroque. I had this picture hand painted on on canvas, 32x48 and now hangs in my living room. It is the most awesome painting ever and it reminds me every day that our Lord is alive and with us.